For the two and a half centuries since it was built as a coaching inn, the Annandale Arms Hotel has been offering food and accommodation to those visiting or passing through Moffat. During its early history travellers probably didn't come to Moffat especially to enjoy the food here, but it is certainly worth making the effort today. The quality of the food on offer has led to the hotel being awarded 1 AA Rosette, and it has ambitions to push beyond that and raise further the standards of the dining on offer: in our view it is succeeding admirably. You can read our hotel review for the Annandale Arms Hotel here. The Annandale Arms goes to considerable lengths to source what it serves as locally as possible. 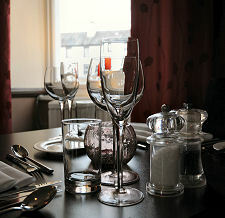 The menus therefore feature Dumfriesshire lamb, Scotch beef, Scottish cheeses, west coast scallops, Scottish mussels, Scottish bacon, Stornoway black pudding and, last but not least, the superb Taylors of Biggar ice cream. Their striving for best quality local ingredients is complemented by careful preparation, attractive presentation and excellent service, and the end result is a meal you will remember: and a dining experience you will want to repeat. 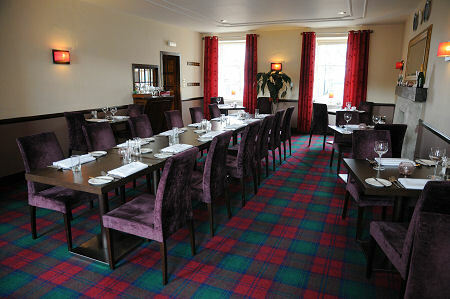 The Annandale Arms offers a range of dining options for residents and non-residents alike. Light lunches are available during the normal lunch time: though with everything from soup and a roll to cottage pie with peas and chips on offer, the hungry need not be put off by the description of "light". And in summer, coach parties are often found in the function rooms on the hotel's first floor enjoying afternoon tea during a stopover in Moffat. But it is for its dinners that the Annandale Arms is best known. Those wishing to dine can do so in either the restaurant or the bar. Bar dinners are served from an extensive menu which incorporates many dishes which also put in a regular appearance on the restaurant's dinner menu. The eight starters on the menu when we visited ranged from soup or salad to scallops or mussels. The seven main courses ranged from ham salad or haggis, neeps and tatties to the hotel's signature dish, "roast marinated chump of Dumfriesshire lamb set on honey and cumin roast carrots and parsnip with a lamb jus". 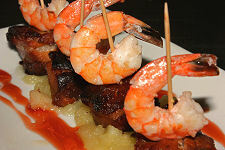 The lamb dish is one that people travel specifically to enjoy. The superb pudding menu in the bar is shared with the restaurant, and when we visited offered a choice of seven desserts plus a five piece selection of named Scottish cheeses. The creamy rice pudding with a hint of vanilla and nutmeg with a scoop of vanilla ice cream was outstanding; as was the Annandale's take on the traditional Scottish cranachan. The menu in the restaurant changes on a daily basis, yet despite this, when we visited offered seven starters and seven mains. The starter of "seared west coast scallops with lardons of smoked bacon, horseradish cream and parmesan crisps" (which also featured on the bar menu) was once of the best scallop dishes we have tasted. For mains we had the lamb dish discussed above, and a "roast loin of barony venison set on a braised red cabbage with a black pudding mash and a red wine jus." The venison was especially delicious, and portion sizes throughout were clearly designed to ensure that no-one left feeling hungry. The overall quality of the food on offer led us to expect great things of breakfast, and we were certainly not disappointed. Both courses were served at the table, and the usual range of cold starters were on offer. Hot main course options included Loch Fyne kippers, kedgeree topped with a poached egg, or the elements of the traditional full Scottish breakfast. Everything was cooked to order; everything was delivered exactly as requested; and everything was delicious. Meanwhile, homemade marmalade and Galloway preserves were available for use on the toast. A really good breakfast which rounded off an all round really good dining experience. You can read our hotel review for the Annandale Arms Hotel here. High Street, Moffat, DG10 9HF.